Some basic qualities of character are helpful in the quest for truth. The most essential is intelligence - which is our ability to judge the difference between truth and illusion. But, beyond this intelligence, we must also possess a sense of proportion – which comes from Wisdom. However, we need to be patient while searching for something that is very subtle. It can be difficult to define Wisdom, but people generally recognise it when they encounter it. It involves an integration of knowledge, experience and a deep understanding that incorporates tolerance for the uncertainties of life as well as its ups and downs. It confers a sense of proportion...of balance. Wise people generally share an optimism that life’s problems can be solved, and experience a certain amount of calm while taking difficult decisions. Intelligence may be necessary for Wisdom, but it is definitely not sufficient; an ability to see the big picture, a sense of proportion, and considerable introspection also contribute to wisdom’s development. Inner Wisdom is the ability to gather information that does not come from conscious reasoning. It can come via feelings and emotions, and sometimes flashes of understanding or spontaneous ideas. Inner Wisdom comes from your higher self; or, if you prefer a more scientific explanation, your intuition (from Inner Wisdom) is the ability to access information that you have stored outside of your conscious awareness. Your mind takes in, stores and processes far more information about the world than you are aware of. 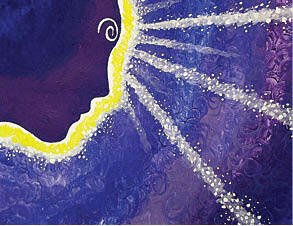 Inner Wisdom is also energetic information – there is power in your thoughts. That is how the ‘telephone phenomenon’ works – when you are thinking about somebody and, the next thing you know, they are calling you! Once you are comfortable receiving information from your inner self, you will want to become comfortable using it. If you are open to receiving it, and willing to interpret and act on this information, you can positively influence your life. Wisdom is far, far stronger than fear, but while fear gladly forces itself upon you, Wisdom knocks gently and then waits to be invited in. You cannot be a victim of wisdom; it must be chosen. So, banish your negative thoughts and learn to play with your inner self, which is much more interesting and liberated. It should become natural for you to use the power of your mind. We all have three levels of mind: the Conscious, the Subconscious and the Super-conscious. Your Super-conscious mind is connected to the ultimate source of information - all that there is to be known and imagined. That is the part of your mind that is intuitive. It is the part of you that we call your Inner Wisdom. Inner Wisdom is beyond our rational, logical and conscious mind. We are generally brought up to believe that the mind is our primary source of information with regard to the world. We learn little, if anything, of our other nature - our Inner Wisdom, which is reached through our deeper intuition, instinct, hunches and the validity of our feelings. It is our inner voice. We do connect with our Inner Wisdom in a variety of ways, though often without knowing that we do so. Someone may say something in conversation that strikes a deep chord in us or we may experience profoundness from watching a beautiful sunset or taking a Nature Walk. We can greatly increase our ability to contact our Inner Wisdom by also being aware of some of the obstacles that normally prevent us from doing so. Sit still and let your mind wander. Try and let go of any need or desire to look for any answers. You will find that while the voice of social conditioning manifests itself as a stream of thoughts in the head, Wisdom often appears as emotions or physical sensations in the body. Brain-damaged patients who lose function in parts of the brain that register emotion may still understand the logic of a problem, but can no longer reason effectively or make advantageous decisions for themselves. The emotional centres of the brain, along with the elaborate bundle of nerves in your belly, have been evolving far longer than any language. And that system, more than logic, is exquisitely attuned to helping you navigate your way through life. So if you are wondering whether a choice is wise or not, instead of searching your mind for a rational argument, try and hold each option in your attention, and then feel its effect on your body and emotions. When something is wrong for you, you will feel constriction and tightness; the wise choice leads to feelings of liberation, even exhilaration. If we push our mind thoughts away from what we should and ought to do, we will find our inner truth. Since the conscious mind tells us what we think we are, an inner voice may initially be felt or seen as something crazy. Giving up our attempts to solve problems with our conscious mind is very threatening to our ego, which wants to remain in control. However, if it feels right it will be right, even if it is not what you want to hear. Wisdom has a hard time coming through the noisy inner chatter – it’s like picking out a single, quiet voice in a crowd. Quiet your mind first by meditating. Pull your thoughts to the here and now, away from the past or the future. Meditation is the best time to openly listen to your Inner Wisdom because, as the mental chatter slows - and, with practice, stops - you can literally hear yourself think. Apart from feeling and knowing at a deeper level, you sometimes can feel a warm glow, a sense of peace or relief. The Wisdom from within is usually soft. It will suggest and advise but never demand the surrender of your free will. It will not conflict with your personal ethics and never asks you to attack or hurt others or force them to do things. It will never be offended if you ignore what it says or if you question it. This voice requires your willingness to want it. The voice from the mind or ego is usually louder and more forceful. It may be confusing or contradictory and you may even hear a number of voices competing for attention. This voice or voices may seek to flatter and to appeal to glamour, specialness and desire for personal gratification. However, when you examine it, it will feel wrong, unless you are attached to the answer - in which case you will try to convince yourself that it is right. It may be that this (outer) voice will mimic the inner voice and even make sense. You have to look at the content. It is better to ask specific questions of your Inner Wisdom, such as: “What should I do about this particular problem?” rather than wide-ranging questions such as “How can I help heal the world?” Often the ego speaks first but, if you listen closely and with patience, a quieter voice will follow. It does not matter if you interpret something wrongly. You may not have followed a hunch or an instinct to do something many times, you may have lost some time by taking a wrong turn, but your Inner Wisdom has infinite patience and is always there for you. It will never reject you because you did not take notice the first time. All your doubts, fears and insecurities are just protective mechanisms of your ego, keeping you from releasing your soul or discovering your inner calling. Your Wisdom is sacred – Divine. It takes you exactly where you need to go and what you need to be. Once you begin the journey of turning inwards, you will realise that the Wisdom of the ages has always been within, waiting for you. Turn down the volume of the world, so that you can hear the voice of Wisdom inside of you. Learn to lead yourself from within. Trusting your Wisdom will help you respect your inner voice, let go of resistance to change, conquer fear and doubt and find the inner strength to move from procrastination, confusion and stagnation to a world of clarity, action and confidence - while helping you express who you truly are. Being mentally relaxed, physically aware and emotionally open is essential to listening to your Inner Wisdom. That Inner Wisdom has a language of its own – a sensory language of feelings.